Hailing from Durham in North Carolina ‘The Pinkerton Raid’ (great name!) produce an Indie/Americana sound based around the writing of the band’s frontman, Jesse James DeConto. This is their fourth full-length album and is based on a band philosophy that the answer to many of our problems lies in the importance of singing together. Not a bad philosophy really – we could all do with a bit more time spent singing together, a bit more time spent being a community. The songs on ‘Where the Wildest Spirits Fly’ have that community ethic; they sound like songs to be sung along with. As the band describes them, these are songs about hope against all odds and listening to songs like ‘Windmills in the Fog’ and ‘Sweet Pitchers of Mercy’ you can hear the positivity spilling out of your speakers. All these songs are very singable and you’re gripped right from opening track ‘Meteors’, with its catchy chorus – “We’re free but we don’t know who we are / Lost our orbits now we’re meteors”. Like many of the songs on this album there’s quite an anthemic feel to this track, starting from a simple acoustic guitar opening there’s a steady build as other voices and instruments come in around DeConto’s strong lead vocals. The anthemic feel continues with hand clapping and you can almost see the audience swaying in front of the stage as the song’s delivered. The problem is that many of these songs have similar arrangements. 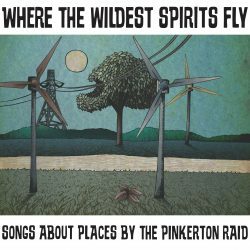 They’ve been crafted with the singalong theme in mind and a choir has been added on a number of occasions, almost signposting the “join in” sections – and you can see this working really well in live performance; a night in a venue in the presence of The Pinkerton Raid sounds like it would be a fine, life-affirming thing. Whether it works so well on record is another matter. There’s a lot to enjoy about this band with some good songs and terrific delivery; but is this an album that would find a regular place on your playlist? And that’s the big question. All the signs indicate that this would be a great band to see live but there’s something about this recording that suggests its not an album you’d play on a regular basis unless you like to conduct frequent singalong sessions in the front room. The album is actually at its best when it steps a little away from the obvious. Tracks like ‘Thin Places’ has a jauntiness that really lifts it up – though the chorus is another signposted singalong – “Meet me in the thin places where the water and fire collide / Meet me in the thin places where the widest spirits fly”, and ‘Jefferson Davis Highway’ is a fine piece of storytelling about the historic highway through the southern States. A very good and very enjoyable album – but its limitations lie in the fact that the songs have been crafted as bar room singalongs and it all sounds like it would be much better experienced live.